It’s a rare thing that human beings can be neatly divvied up into two categories. But occasionally, situations arise where you either ARE, or you AREN’T. Runny eggs are just such a situation. You either coo and clap your hands at the thought, or you shudder with disgust and wonder why nobody ever told those food freaks about salmonella. 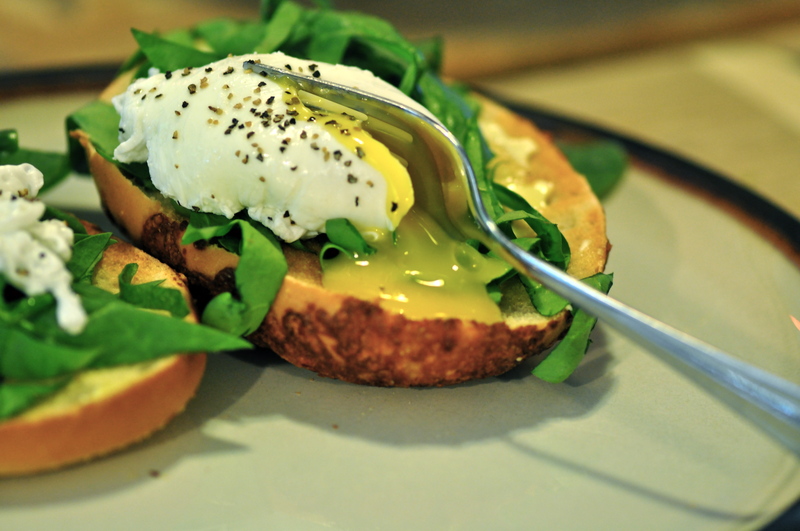 For the record, poached eggs are generally safe to eat. Use good quality (no cracks!) fresh eggs that have been previously refrigerated. 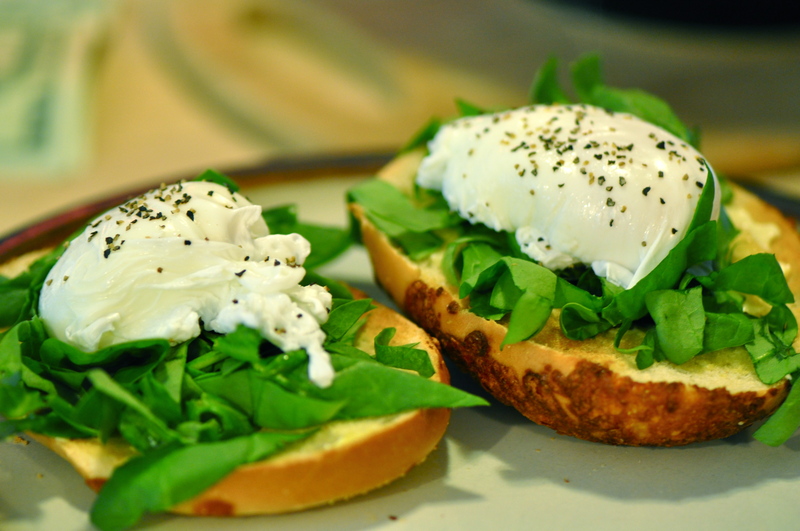 As long as you have an ounce of common sense, and don’t let your poached eggs sit out at room temperature for 5 hours before you get around to eating them, you’ll be just fine. Along with roasting a chicken, poaching an egg was one of those cooking tasks that just intimidated the heck out of me. I’ve heard how difficult it is to do; that one generally has to waste a whole carton of eggs to get a single perfectly poached egg. But today was a dreary and wet New England afternoon, and I wanted something warm, savory, and healthy for lunch. A simple google search landed me at one of my favorite cooking blogs: Smitten Kitchen. And it was here that I learned how to poach an egg. I’m not going to bother posting the instructions, because you can see them for yourself by clicking the recipe link, but I just wanted to share that this worked out really well for me. I used a stainless steel saucepan, so I was worried about the eggs sticking to the bottom. I splashed a little olive oil into the water along with the white vinegar. I don’t know if this made a difference, because this was my first attempt at poaching eggs, but they didn’t stick! I’m either lucky or skilled, but I only wasted one egg before I got the hang of it. My mistake was not letting the water get hot enough. The directions said to use water that was hot, but not simmering or boiling. But I found that this wasn’t hot enough, and I wound up with a cloudy mess in my saucepan. On my second try, I let the water begin to simmer and bubble a small amount. I used my spoon to create a whirlpool, and quickly slid the egg into the water from a small bowl. Once the whites formed, I slid my spoon under the egg just to make sure it didn’t stick to the bottom, and kind of pushed it around in the water a bit, rolling it over a few times. After a few minutes, I scooped it out and drained it on a paper bowl. I admired my lovely and decadent lunch for a moment, then smashed up all that pretty egg with my fork and devoured it. What a heathy lunch, and yes, the water has to be at least simmering for the egg to hold together. Looks so good, I think I may make it for Dad and my dinner one night.